I have finally recovered from our lovely holiday. Boyfriend, romantic to the bone and also a surrealist and a believer in our superhero powers which we definitely don’t have, decided to combine his workshop in Croatia with a Venice getaway. Let me tell you how this went down. It was romantic alright. And I didn’t get hospitalised. 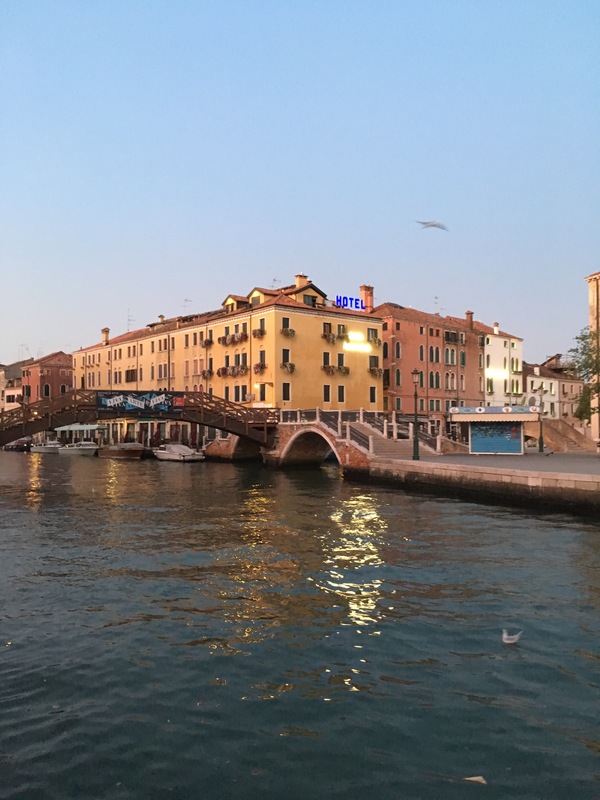 We arrived in Venice on a Monday evening. We took a taxi from the airport to Santa Croce, where our Airbnb was located. The taxi fare is £40, fixed price, which is pretty decent. I am not mentioning the name of the Airbnb because I don’t recommend it but at the same time it was not that bad as to red flag it. Simply put, it was a misunderstanding that was settled with a lot of shouting from the girl that welcomed us. She was an employee, an unhappy one even, and I know how it feels to work a lot for little money. That is why we didn’t complain and we didn’t leave a negative review. We are trying to stand our ground while staying decent and I must say this is a tricky balance to keep when you are hungry and tired. Some situations turn the wish to be kind into a difficult task but it is worth it. Kindness is always sweeter than revenge. After this hiccup, we went out for pizza. In fact, boyfriend had pizza and I had an Aperol, because I stuffed myself with Thai Chicken Curry at Gatwick Airport and I was completely full for the next 24 hours. My troubles started the next day, when boyfriend decided he wanted us to see the sunrise. I don’t do sunrises because I don’t do 5 am or 6 am. I can barely do 7 am and I only cope with it with the help of a lot of Romanian swearing. I was about to say Romanian dirty swearing but there is no such thing as Romanian clean swearing. Boyfriend woke up at 5.30 and started banging and dropping things on the floor, in the most subtle way possible. I could have pretended I didn’t hear anything but I love him and he rarely wants something I don’t want. So I indulged him and went out in Venice at bloody 6 am. I was sleepy and grumpy but well, I liked it. Empty streets and sun rising over the canals, painting the buildings in glowing honey-like colour. Too bad nothing was open. I would have liked to sit down for a coffee by a canal, watching the city changing colours and coming to life. After this very intrepid and out of character action, of course I went back to bed till 10 am. It was good but not enough. At that point, I could have slept for a week. I cannot function without my eight hours of uninterrupted sleep. I really can’t. 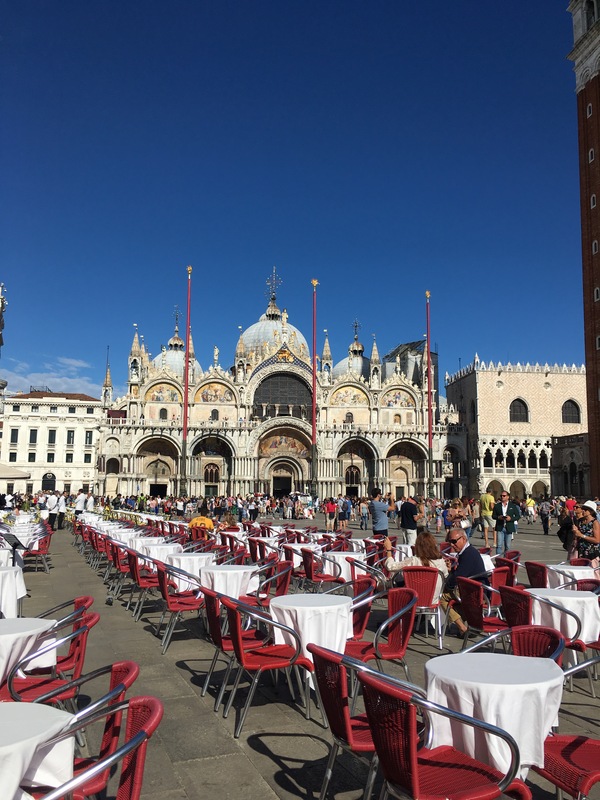 We started the day with cappuccinos and the softest pastries I have ever eaten and we started our way to Piazza San Marco. It took us almost an hour to get there because we kept turning our heads to pretty windows and to narrow streets. Venice is magic. It is even more beautiful than Rome, if that can be possible. It is the most beautiful city I have ever seen and I have at the top of my list places like Athens, Barcelona and Amsterdam. 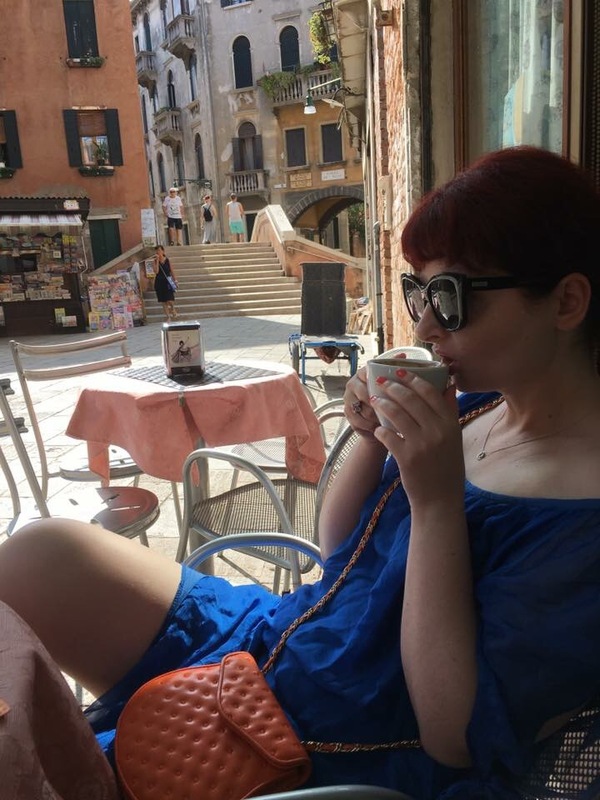 We spent the next couple of hours at a very expensive cafe in Piazza San Marco, because boyfriend needed wifi and a quiet place to work. He was due to deliver his workshop in Croatia in 48 hours. We forked £60 euro on two very small but very good sandwiches, mine with prosciutto crudo and brie, an icecream, a single esspresso and an orange juice. With our pockets bleeding, we took a vaporetto to the Airbnb to pick up our bags and go to the port to catch our ferry to Rovinj. Boyfriend was confident he bought the ferry tickets in April or so but guess what? He didn’t. Luckily, there were free seats and we made it on the boat eventually. After half an hour walk, pulling my suitcase on narrow streets and trillions of bridges with zillion of steps, I was cranky as hell, not to mention tired. 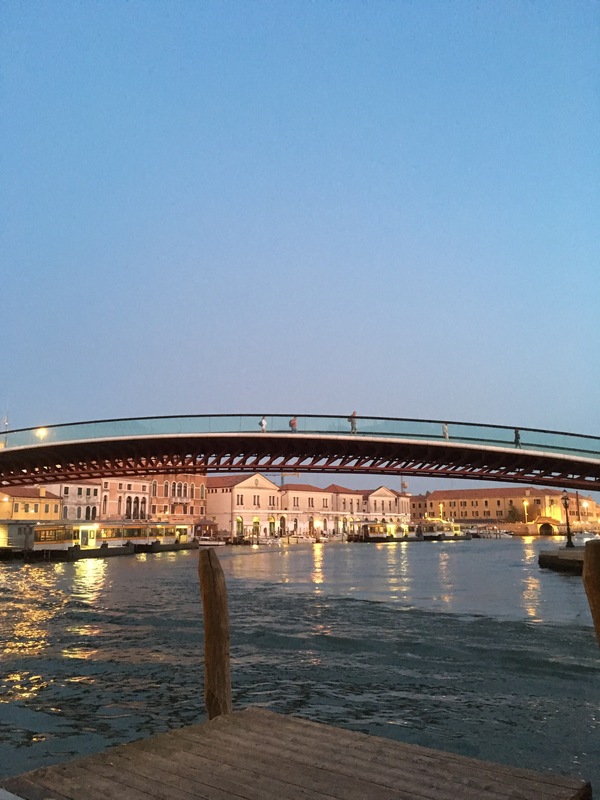 Venice is stunning but you kind of dislike the damn bridges when you have to carry a seven kilos bag over them, in full blast summer heat. Long story short, four hours and a couple of Bellinis later we were in Rovinj, eating fish. But let me tell you about this next time. Now, I want to tell you about this Dior lipstick I am giving away. You have this whole week to leave a comment and tell me what is your favourite destination and why. I will choose the winner on September 18. FYI, I will be extremely subjective! I will either choose the weirdest destination, the most poetic reason or maybe I will choose the person with the funniest answer. I don’t know! There is no in place criteria. Just join the conversation and we’ll take it from there 🙂 UK only! I am crazy inloved about Venice. Is my number one, no matter what. This is what brought me on your blog. 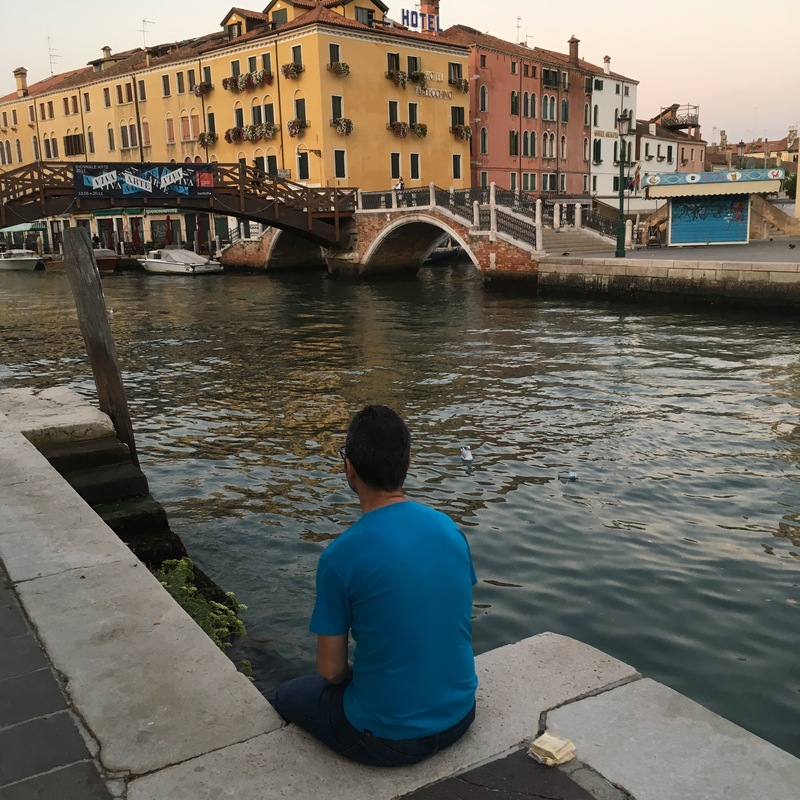 Despite the crowds, Venice can offer you monumental quietness and peace, if u know how to walk in the streets. Amazing history and soo much beautiness, it remains in your heart forever. I am also inloved of Bellini for its pink colour, looks like the elixir completing all the beautiness that sorrounds us. I could talk a lifetime why Venice! I am already planning my summer holiday in Venice! You are right about the quiet streets, I loved being away from the crowds of tourists, but I hate people in groups, they make my anxiety plummet 🙂 Thank you very much for your visit and for your comment. Venice part 2 will be live tomorrow, if you want more of it! Dior Lipstick, now we’re talkin’! My favorite destination is Barcelona, and you know why? Because I’ve been there around 20 times and I keep coming back! It was the place where I spent my honeymoon (I don’t know if you can call it honeymoon when it’s only a week, but still), I’ve been for conferences, backpacking and it’s still magic! I remember walking in Barrio Gotico in the morning sniffing at the Napolitanas (those nice things like pain au chocolat, only much better), sipping the cafe con leche and being warmed up by the sun. I read your blog and I love it (the old one too), you’re real and funny! Keep writing, you make people like me smile. Hi Andreea! I only went to Barcelona once but I have been planning to revisit for ages now. It’s just there are so many places to see and I don’t have energy and money to travel more than 3-4 times a year. 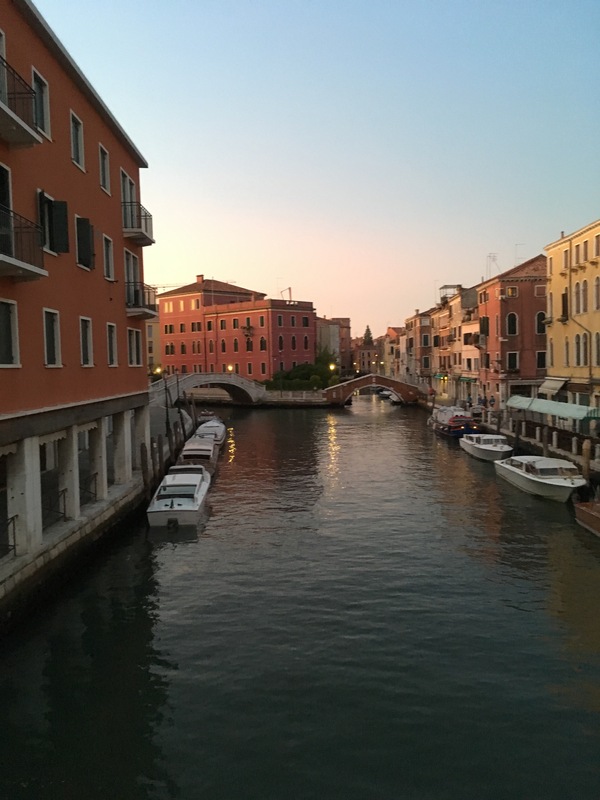 Venice was the best finding ever, I simply can’t believe such a place exists! Thank you for your comment and yay! the lipstick is yours! I do hope you live in UK, otherwise the shipping will be a bit tricky. Please drop me an email at lavinia.coaje@gmail.com with your address and I will keep you posted about the delivery. Hoooray! Yes, I live in the UK, I’ll send you an email with my details. My next destination is Lisbon as well! Going there next month!